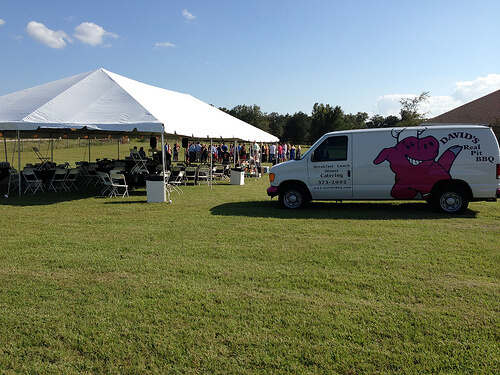 On-site BBQ catering events are probably the most fun of all types of jobs we do. While we love getting to play a role in your special event, we remain professional while doing it. We know that our job is to make sure that the food is outstanding and that the service goes smoothly so you can enjoy your event with your guests. David’s BBQ Catering On-Site is great for all day events like graduation parties, birthday parties, or even corporate catering events. While some catering providers might prefer to lay low in the background, we actually enjoy it when guests come up to us and pick our BBQ brains! We have no problem talking BBQ tips and techniques while we let the smoky goodness and succulent sauces work their magic. We feel that this is where you get the most value out of our service and what really sets our BBQ catering service apart. At David’s, we love our BBQ and being able to talk to people about it makes it all worthwhile for us! From talking about different cuts of meat we prefer, to letting guests in on some of our secret tips and techniques they can take home on their own grill, we really enjoy getting to share our knowledge with them. Or if you prefer, we can stay completely out of the way next to our grill so you won’t even know we’re there…except for that deliciously seductive, mouthwatering smell! And please, don’t be worried at all about the cleanup process. We take away every bit of the trash we produce and leave your spot in the exact same condition we found it in. We really do try to make our events hassle free for our customers, allowing you to worry about nothing but enjoying the event itself. When you’re looking for catering in Gainesville, FL, come to David’s BBQ to make your event an absolute success without all the stress! 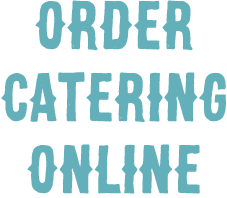 Get your catering from David’s BBQ for amazing service, smiles, and out of this world barbecue! Call Us Today!